Complete age-defying kit from the Platinum line, accompanied by a sparkly purple tote bag. MPC (Milk Peptide Complex) is a registered trademark of CLR. NuLastic Silk is a registered trademark of Alzo International, Inc. Ingredients: Aqua/Water/Eau, Cyclopentasiloxane, Hydrogenated Polyisobutene, Glycerin, Butylene Glycol, Isodecyl Isononanoate, Polymethylsilsesquioxane, HDI/Trimethylol Hexylacetone Crosspolymer, Cetyl Alcohol, Glyceryl Stearate, Polyacrylamide, C4-24 Alkyl Dimethicone/Divinyldimethicone Crosspolymer, Polydiethyleneglycol Adipate/IPDI Copolymer, Prunus Amygdalus Dulcis (Sweet Almond) Seed Extract, Acetyl Dipeptide-1 Cetyl Ester, Hydroxyethylcellulose, Sorbitan Laurate, Sodium Hyaluronate, Caprylyl Glycol, Hydrogenated Lecithin, Pearl Powder, Zingiber Cassumunar Root Oil, Platinum Powder, PEG-100 Stearate, Behenyl Alcohol, C13-14 Isoparaffin, PEG-75 Stearate, Ceteth-20, Steareth-20, Laureth-7, Silica, Tocopheryl Acetate, Retinyl Palmitate, Tocopherol, Disodium EDTA, Tetrasodium EDTA, Phenoxyethanol, Fragrance (Parfum), Alpha-Isomethyl Ionone, Amyl Cinnamal, Benzyl Salicylate, Butylphenyl Methylpropional, Citronellol, Geraniol, Hexyl Cinnamal, Limonene. Ingredients: Water (Aqua), Cyclopentasiloxane, Glycerin, Octyldodecyl Stearate, Tridecyl Trimellitate, Isodecyl Isononanoate, Pentylene Glycol, Whey Protein, Hydrogenated Lecithin, Polyglyceryl-3 Beeswax, Hematite Extract, Mica, Caprylyl Glycol, C4-24 Alkyl Dimethicone/Divinyldimethicone Crosspolymer, Polydiethyleneglycol Adipate/IPDI Copolymer, Zingiber Cassumunar Root Oil, Arachidyl Alcohol, Cetearyl Alcohol, Dimethicone Crosspolymer, Polyethylene, Behenyl Alcohol, Hydroxyethylcellulose, Ammonium Acryloyldimethyltaurate/VP Copolymer, Arachidyl Glucoside, Cetearyl Glucoside, Xanthan Gum, Stearamidopropyl PG-Dimonium Chloride Phosphate, Citric Acid, Sodium Hydroxide, Tetrasodium EDTA, Methylisothiazolinone, Titanium Dioxide (CI 77891). Ingredients: Aqua/Water/Eau, Glycerin, Butylene Glycol , Bis-PEG-18 Methyl Ether Dimethyl Silane, Polymethylsilsesquioxane, Palmitoyl Tripeptide-5, Silica, Caprylyl Glycol, Carbomer, Prunus Amygdalus Dulcis (Sweet Almond) Seed Extract, Saccharomyces/Xylinum/Black Tea Ferment, Chondrus Crispus (Carraggenan), Hematite Extract, Xanthan Gum, Hexylene Glycol, Niacinimide, Centella Asiatica Extract, Zinc PCA, Hydroxyethylcellulose, Chlorella Vulgaris/Lupinus Albus Protein Ferment, Nasturtium Officinale Flower/Leaf Extract, Colloidal Platinum, Glyceryl Acrylate/Acrylic Acid Copolymer, Zingiber Cassumunar Root Oil, Sodium Citrate, Sodium Hydroxide, Citric Acid, Alcohol Denat., Phenoxyethanol, Fragrance (Parfum), Amyl Cinnamal, Benzyl Salicylate, Citronellol, Hexyl Cinnamal, Butylphenyl Methylpropional, Limonene, Alpha-Isomethyl Ionone, Titanium Dioxide (CI77891). Love all of these products and the sparkly tote. The products all work great and I am beginning to see much improvement in my 67 year old complexion. Thank you Prai! My skin has never been this soft! These creams feel so great on the skin and you can feel it firming your skin. 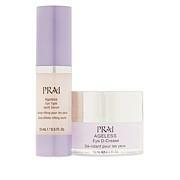 I love all the Prai creams and have recommended them to friends and have given them as gifts for them to try and they all seem to like them as well. I have seen a difference in my skin with them. So, I am a skin product junkie - but this regimen is already showing a difference in my skin - especially around me eyes. It is great - I was skeptical (having had promises before) but so happy I gave this a try. And the cases are beautiful - and so is the bag. Cannot go wrong with this. Love the product. Not to heavy.Very light cream. 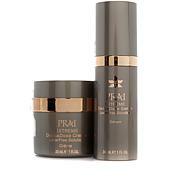 PRAI Platinum Firm & Lift Serum - .35 fl. oz.